I'm going camping in two weeks and I really don't want to get bit up by mosquitoes. So I want to figure out a way to commit total genocide of all mosquitoes in at least a 20 mile (32 KM) area around the campsite. I also want the camping trip to be enjoyable, so nukes, doing a total gamma soak, or otherwise irradiating the area is not going to be a good solution. Ideally a budget of around $100K, and while the area should be mosquito free, the solution should not kill the non-bloodsuckers. I'd also prefer not be be tried for war crimes. As to technology level, let's say current to very near future, thought the more current the better. Edit: To close voters real world questions are on topic. by using a combination of UV light and the small amount of Co2 gas produced from the titanium dioxide impregnated collars on the inside of the traps. The gas is produced through catalytic reaction from the UV light and heat produced from the lamps. 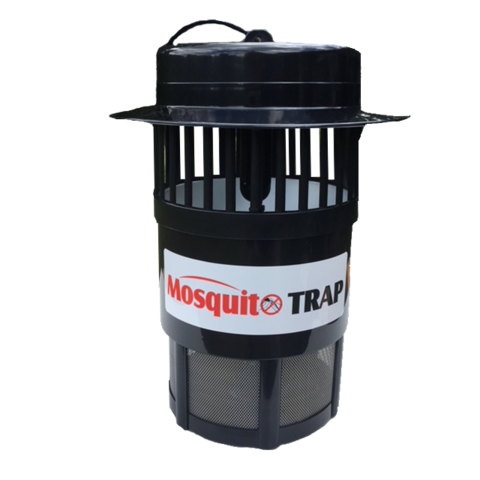 When the trap is running the centrally mounted fan creates a powerful downdraft that mosquitoes entering through the upper windows searching for a blood meal are powerless to resist. Once trapped the constant flow of air around them in the basket, kills them by dehydration. For a low price of $129 you can get one. This means you can afford 775 mosquito traps. By evenly dispersing them, I'm pretty confident that there would be little, to zero, chance of you as a mosquito resisting going into one and surviving. Come to Steve's Ant & Mosquito-Free Resort. Many years ago eccentric wanna-be billionaire Steve decided to built a natural wildlife reserve without pesky mosquitoes. To this end he took 32 km² of prime country (a circular park 6.2 km in diameter). Sealing it in a dome using special air filtration systems and airlocks he wiped out all the mosquitoes and ants in it. Then it was repopulated with carefully selected animals, flora and fauna and insects that don't bother people. Now we are ready to open it to the general public. For a small premium you and your family can enjoy a camping break in our fine resort. How can we afford this? Well, the fee is \$ 100K to help pay our investment costs. But worth it for the family that likes to have camping holidays without hospital stays afterwards - think of the savings! And we have easy terms and you can pay this once in a lifetime trip off as easy monthly installments. No hostile species that might eat baby Jane. We didn't let any of those nasty mountain lions, coyotes, rattlers and bad bears into the park. Our deer is guaranteed to be more Bambi-like than in any other park. I am not talking about burning down the area, no. Simply making a big stack of wood, or many small ones around the campsite and setting them on fire will mostly suffice. That's what we did in Sweden during midsummer night, anyway. The little suckers really hate the smoke, and it also makes for some great atmosphere & is also great fun for the kids! Maintaining a bigger area, you will probably need to hire someone to help you maintain the flames. But baring a heavy rain, that's all in the way of it. If you want to invest against the rainfall as well you might want too look into substances such as napalm. Sadly (or luckily if you ask a biologist) that solution won't exterminate the bloodsuckers, so there's no permanent danger to the biosphere. Genetic engineering terminator genes into the local mosquito population would eliminate the mosquito population since the genes spread far through the population, and then when 2 mosquitoes mate that have the terminator sequence they produce offspring that are sterile, leading to the collapse of the population. +100 for unintended consequences and it spreading worldwide, eliminating virtually all mosquitoes. Or you could just buy a cheap metal net, electrify it at night and enjoy the sound of the suckers frying themselves. Other than that, unless you use a kiloton of good ol' DDT, you can't wipe out mosquitos in such a wide radius without eradicating the rest of insect life. With a few tweaks, the popular repellent can be made even more potent, giving the little monsters teeny-tiny panic attacks. Deploying in a ring arrangement, with your campsite at the center, using a smoke bomb as a base, the pests can be driven away to a radius of your choosing. Simple. Relocate several thousand bats to the area. Also, camp under a walnut tree. Mosquitoes and other insects avoid them. Wipe out mosquito larvae with acoustic larvicide. Acoustic larvicide is a relatively young technology with controllable results. If you blast sound waves somewhere between 18 kHz and 30 kHz in water where larvae are growing, it will rupture their air bladders and either kill them immediately or otherwise prevent them from fully maturing. Depending on the duration and intensity of your acoustic death ray, you can control approximately what percent of the population is killed. These devices seem to be available for sale currently. A handheld device can be purchased for about \$7000 (probably less now, that article is from 2012). A larger one may cost a bit more, but probably still well within your $100k budget. Hire a couple of fellow mosquito-haters to use it on all the standing water in the area once a week for a couple months before you go camping and there should be none left to bite you. No immediate effects on biting population. You must prepare beforehand. Mosquito predators. Something already exists called "fly predators", which are a parasitic wasp which kill fly larva, but which are themselves invisibly tiny and harmless. Breed them in a lab and spread them in such a concentration that they kill all the mosquitoes before starving to death. To prevent unforeseen ecological problems, make it so they can't breed outside of the lab (maybe make them all female, just don't use any frog DNA!). Step 1: Hire as many bums and/or college students as possible. Step 2: Buy as much extremely cheap booze as possible. Step 3: Put the booze into the bums/college students. Step 4: Strategically position the bums/college students throughout the desired area. Step 5: Wait for the mosquitoes to strike. Flies and bees can alcohol poison themselves to death eating rotting fruit. Hopefully this also works for mosquitoes. Step 6: Enjoy not having mosquitoes. On the minus side, the mosquitoes will come back eventually. On the plus side, you'll be too drunk to care! For $100k you can have your very own mosquito chopstick bot and a years supply of tadpoles. Your mosquito chopstick bot will diligently pluck mosquito's from the air all day and night long until the job is done. Your tadpoles need only be slipped into any standing water, they delight in slurping mosquitos larvae down from the surface. Hmm yummy. The most migratory of mosquitoes only travel a maximum of 7 miles (11.26 kilometres) from their birth point as larvae (wrigglers). Therefore you could treat every water source within that range of the borders of your protected area where larvae can spawn with a solution. Possible solutions include Bti (Bacillus thuringiensis), methoprene, or oil and also the introduction of natural predators in large numbers. Guppies (small fish) or Gambusia (a mosquito hunting specialist guppy species that are already used in this way) would be an excellent candidate as they can be introduced and breed rapidly. The introduction of small birds such as purple martins, swallows and waterfowl would prey on the adult mosquitoes. Dragonfly nymphs also hunt the larvae and dragonfly adults the adult mosquito form so they could be bred up in large numbers and introduced as well. You'd also have to enforce strict water receptacle controls within your boundary, therefore remove containers where small pools of water can form after rain. It would also help to provide mosquito lures outside your borders to redirect the mosquito population as well as planting citronella and others plants which repel mosquitoes within your boundary. Here's the Photonic Fence Patent/info Page you can probably license it from them if you are doing a huge number at scale, but they probably want a lot of money. I don't know the legal ramifications of building your own version for personal use using info you can find about theirs as a reference... but my gut says it's probably fine even without a license, so long as you don't cause them any negative publicity or otherwise irk them. Building said device for under $100 (probably not including tooling) would be extremely difficult, but almost certainly possible if you throw enough time & skill at it. Most answers that will kill a large number of mosquitoes would also cause a lot of collateral damage to other native life in the woods you go to. Some would cause collateral, irreversible damage to humans, and probably property as well. You cannot kill all mosquitoes in an area without causing irreparable ecological wreckage. If it were possible, we would not have problems like Malaria and Dengue in the world. You can, however, kill all mosquitoes that come close to you. As some have mentioned, mosquito lasers are a thing. You will kill the odd fly or bee as well, but you won't be causing more damage than you would already cause by stepping on insects by accident anyway. You can also invent some sort of machine that mimics human sweat in smell, and which traps mosquitoes inside it. With small holes, this would be a very specific selector - any other insects that get in will do so by accident, and will be a minority. Just leave a few of these turned on in the area you are going to for a few days prior to your trip, and also during it. Finally, in many mosquito species males make a sound which is inaudible to us, but which tends to scare females (and only the females bite humans). You could have soundboxes making this sound 24/7 - it will not kill them, but it will scare all but the rare deaf females away. Those could be dealt with electric rackets, which would do for a fun camping activity. It's a well known fact that mosquitos preferentially bite women, Particularly pregnant or ovulating women, so bring plenty of lady-friends and they can be your bodyguards. For $100k you should be able to pay for travel expenses for a hell of a lot of your friends. And if you don't have that many friends, you can achieve the same result with strangers. This plan doesn't strictly kill all the mosquitos, instead providing alternative targets. However you could use the "blood poison" approach. There are "vaccines" in the works to poison and kill any mosquito that bites a treated person, they're intended to protect against Malaria. Combined with $100k worth of human shields to not only avoid being bitten but kill any mosquitos around it would probably achieve exactly the result you're after. Radius can be achieved by encouraging hiking amongst your group, but coverage is likely to be a bit spotty. For best results, wait in the tent for a few days before emerging, the worst of the biting (and grousing) should be over by then. As mosquito's home in on CO2, the easiest route is to place updrafts of CO2 in localised areas (all over the place pretty much). It's hard to home in on people if there is a nearby CO2 updraft or it varies at random continuously. The concentration doesn't even need to be high - just enough (and close enough together) to make prey detection impractical at any range. So it doesn't have to even be lethal to mosquitoes. This isn't an issue for you, your guests, global warming/climate, or any non-bloodsucker. The only critturs attracted specifically to CO2 will almost by definition be those locating prey by their breath, which is basically bloodsucking insects looking for larger beings. Other insects might be affected by CO2, but the concentration would be low, so it wouldn't be lethal - and the amount of time an insect spends in a CO2 updraft would be linked to its bloodsuckerness - non bloodsuckers only enter updrafts at random, and leave them at random, so they get below average exposure even among all insects. Dedicated bloodsuckers on the other hand may be drawn to the updrafts but can't find prey within a varying environmental level of CO2. Humans and mammals of course aren't likely to be affected at all. Even exhaled air contains considerable oxygen, and a higher level of CO2 isn't a problem - if needed the level of O2 could be raised slightly, the same way, which would benefit humans and animal life, but give no benefit or encouragement to bloodsuckers. The environment of course won't be affected - on a global scale any amount used will be microscopic in the context of other sources. You should be able to get a substantial lizard population for $100K. The only real downside is that whatever eats lizards in your area is gonna have a field day and probably a population surge. Of course, if you wanted to be more practical 10 cans of spray-on DEET is probably cheaper then $100k of lizards, and may actually work better. For $100k you could build "The Oracle"! 1,000,000 lumens of irresistible ultraviolet light up a big pole surrounded by a cage energized with 100kV of electricity. Zap! Mosquito's come get me! Mosquitoes home in on the carbon dioxide of your breath when you exhale. Based on the old adage of 'can't see it, can't bite it', the solution is simple: don't exhale for the period of your camping trip. Scuba re-breathers, space suits (such as Armstrong wore on the lunar surface). Large fans to disrupt carbon dioxide concentrations (which has an added bonus, since mosquitoes are poor fliers). Your own genetic mutation to exhale less or no carbon dioxide. Add birth-control tablets to all the water sources within a specific radius up to three months before your trip. I'm sure you'll be okay with the effects it'll have on you - it's for the greater good, right? If such changes do not appeal to you, Plan B is to find each mosquito, and remove its wings surgically. They'll still bite you, but they'll have to walk all the way to get to you first. But the best (saved for last) is a patent I'm working on; something I like to call 'The Slasher'. It is a system of cut-throat razors, strategically positioned around the camp site. The mosquito lands, and as it looks from side to side to select its target, it decapitates itself. So, assuming you camp on a flat ground (grassland, beach...), installing giant fans providing constant wind would protect you (without killing mosquitoes). I remember reading an Asimov novel (maybe The Bicentennial Man) where, to avoid loopholes in the Three Laws, human designers decided to make them unnecessary: robots are specialized for small tasks and some of them are just robotics birds that prey plagues. You could have in the near future small drones that hunt just mosquitoes, ignoring any other animal. So you could release a couple of dozens of these drones clean the field without affecting any other animal. Have you considered camping in a more northern climate? They don't like cold weather, they don't like dry weather, and they die very quickly in either. Not the answer you're looking for? Browse other questions tagged science-based or ask your own question. Mosquito Assassin 2: Curiosity killed with A catalyst!